Both Trump and Kohli are Straight forward persons. They have guts to say whatever they feel. On different occasions, both have proved their dominance. One is the head of the most powerful country in the world, other is the head of the No. 1 Test team. Both Leaders lead their respective organization from the front and always gives 100 percent. Both are known for their fearless style. They know how to destroy their enemies. 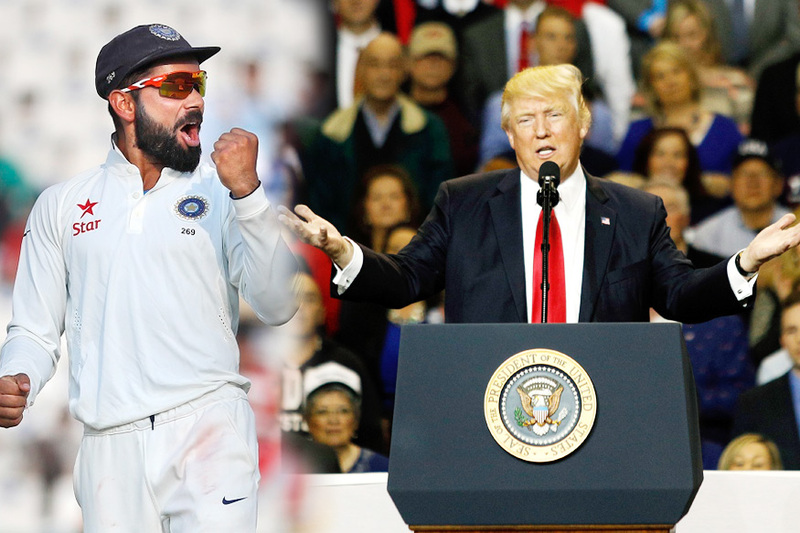 Both India and USA have never seen a player and a president as aggressive as Kohli and Trump are. Trump is known for his provoking type of politics. Both the leaders have a tendency of ripping apart their opponents through foul languages and obscene gestures. Both Trump and Kohli have that compelling attractiveness or charm that can inspire devotions in other. Also, both have a huge female fan following. Coming to the Test series between Australia and India, Glenn Maxwell was seen mocking Kohli’s injury when he imitated his action by clutching his right shoulder after his dive to save a boundary. There was already enough bad blood between the Indian players and the Australian players, what with the DRS Referral controversy and the on-field sledging.